Is Under The Dome Kinda Just Under The Dumb? Yes, that is the actual pre-credits exposition we got at the start of episode two of Under the Dome. A straightforward intro for a straightforward show, and one I'm having fun with so far, even if it is pretty dopey. The show, if you haven't heard of it, is CBS' adaptation of Stephen King's novel of the same name. I've read a fair amount of King, but not this particular book. Given the feedback I got from Twitter last night, it sounds like I can safely skip it. The show is helmed by Brian K. Vaughan, author of, among other things, the graphic novel series Y: The Last Man, better known as "One of Kirk's favorite things ever." The show's got Dean Norris from Breaking Bad, some good network-appropriate gore, and a great, Twilight Zone kinda setup. It's the stuff that good summer TV time-wasters are made of. 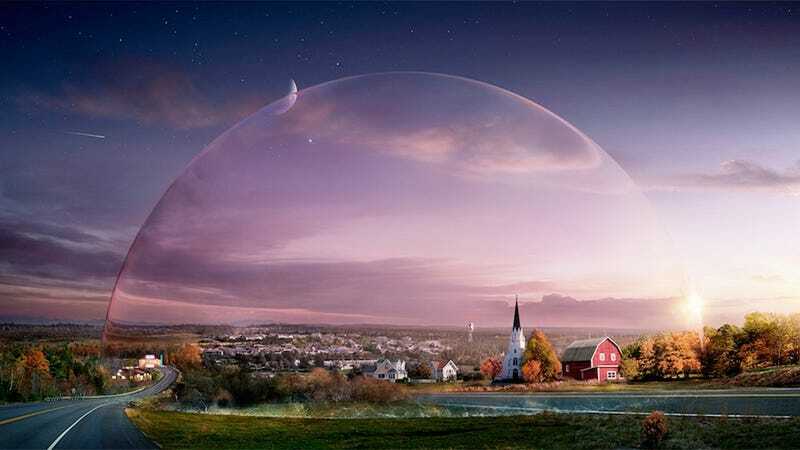 The premise, if you hadn't guessed from the show's title, is this: A small town in Maine (where else) is suddenly encircled by a massive, mysterious and impenetrable dome. This leads to all manner of drama. While Under the Dome can be awfully dumb, sometimes even edging up to wasting its fun premise, it has enough cool stuff going on that I'll keep watching for the time being. I'm curious what you, fellow fans of sci-fi and cheesy but entertaining television, make of this show. Are you watching? Have you read the book? Do you agree that the show's writing leaves a lot to be desired? Do Vaughan's teleplays make you wonder if maybe Y: The Last Man had lousy dialogue and you just didn't notice? Do you, like me, actually find yourself pretty unbothered by all that stuff and enjoying the show anyway? I leave it to you. Discuss.